The lotus flower symbolizes rising from the muddy depths into light, beauty and rebirth. This is how a lotus flower grows, and is symbolic of the enlightenment of Lord Buddha. Starting with a blank piece of paper, a fresh cut lotus and ink, my lotus art commences with but one impression from a cut lotus stem, then continues into thousands. 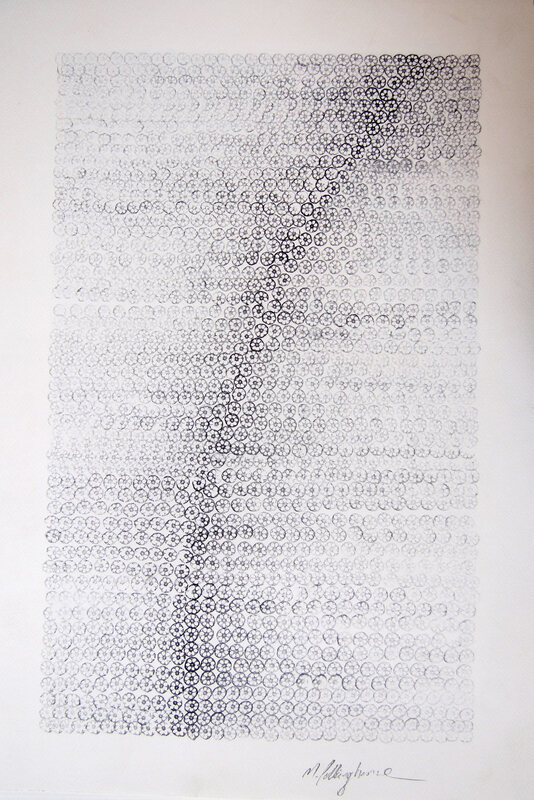 The shading and the density of these “stamps” produce undulating patterns. Some works may consist over of 10,000 lotus stalk impressions. Each lotus stalk can be used repeatedly before it needs recutting. The depth of the shade depends on the quantity of ink on the stamp and the length of time it is held on the paper. 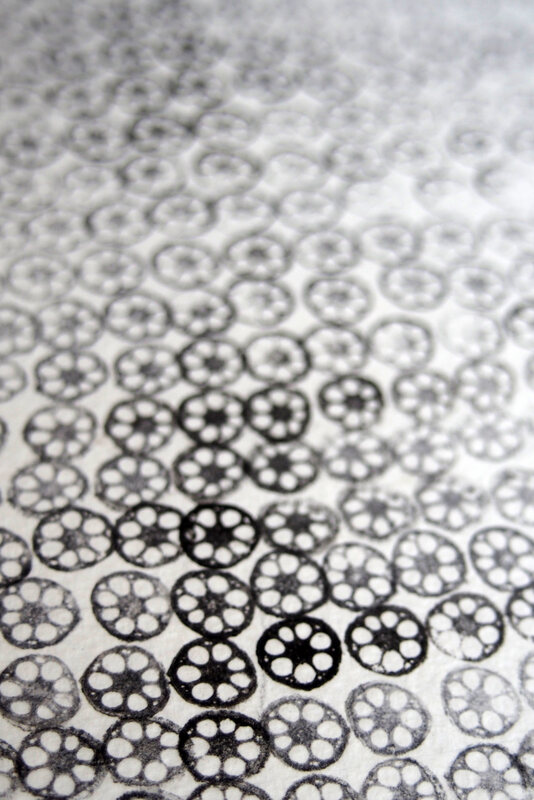 Some lotus art designs start as a dot-to-dot drawing, while others commence as a pencil sketch inked in with the lotus. Once an impression is inked, it can not be undone or altered. 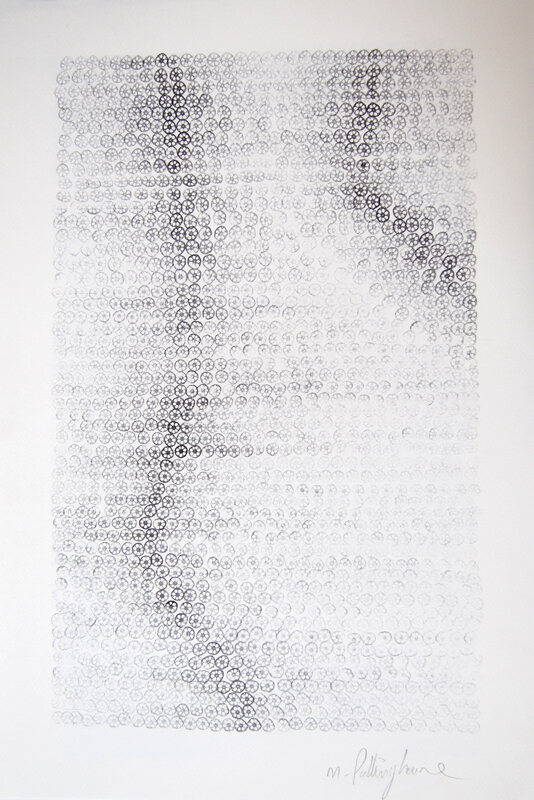 All works are produced on unsized-, acid-free art paper. After a Buddhist celebration is held at a local temple, we collect massive loads of discarded lotus flowers to dry. The petals are burned and the ash is then stored for twelve months, blended with rain water. This lotus flower ink is used exclusively in my artworks. Morrison Polkinghorne grew up in central Australia. He is also a skilled textile artisan, designing trimmings and tassels. Inspired by his textile work, where he repeatedly weaves the same pattern over and over to re-create classic old fringes and braids, he finds joy in repeating painstaking patterns over and over in his inked lotus art. Every art peace is individual.